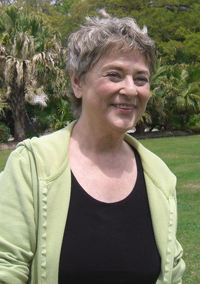 Gretchen Reinike Eppling was the second of three children born to Charles and Vera Reinike. She was born in 1940, in New Orleans, LA, and grew up in a household where art was the center of everyday life. Art materials were plentiful and her parents were skilled teachers. During the hot, muggy Louisiana summers her parents would take their art students and Gretchen and her sister, Audrey, to their summer art camp in St. Francisville, LA. The young Gretchen thrived in this environment. When she went away to Barat College, it was little wonder she majored in Art. But she met Herbert Rothschild and they married. She left her schooling and accompanied him to Yale and Harvard where he received his degrees. She was wife and mother to their four children while she tried to continue her studies. When Rothschild accepted a teaching position at LSU, Gretchen was once again back in Louisiana. She volunteered to teach art at a local elementary school and she began to exhibit her work at The Baton Rouge Gallery. In the 1970’s she also began to show at Reinike Gallery in New Orleans. In the early 1980s, her marriage to Rothschild ended and Gretchen moved to New Orleans. She had always been a tireless volunteer and loved to work with children who needed her patient and enthusiastic approach to bringing out their creative abilities. So Gretchen began to teach children’s art workshops at the Children's Museum. Gretchen married her high-school sweetheart, Irvington Eppling after they rediscovered each other following a chance encounter. He valued Gretchen’s talents and encouraged her with her work. He passed away in 2001. Although she no longer teaches, Gretchen continues to paint. She shows her work at Reinike Gallery and she attends the annual group show in November.